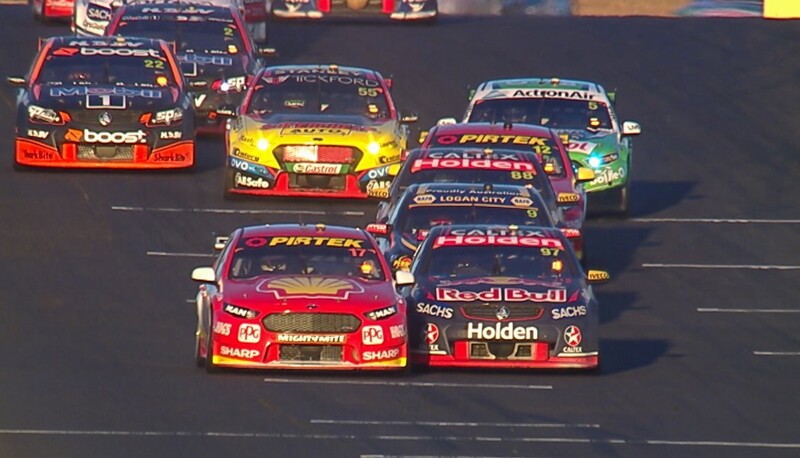 A verdict on the controversial Safety Car restart involving Scott McLaughlin and Shane van Gisbergen in Race 17 is expected to be delivered later this morning. Van Gisbergen’s move for the lead on McLaughlin at the restart triggered a post-race investigation that is yet to be concluded. Television footage showed the Red Bull Holden pulled alongside McLaughlin’s Shell Ford on the way to the control line before completing the move into turn 1. Uncertainty surrounded the timing of the overlap, which cannot occur until after the green flags fly. The relevant rules state that: “After the SC (Safety Car) has entered the Pit Lane, the RD (Race Director) will instruct the yellow flags and SC boards at the flag posts to be replaced with waved green flags until the last Car crosses the Control Line. “Once the green flags are displayed, Cars are permitted to accelerate or maintain their current speed, but not slow down, up to the Control Line. “It is permitted to overlap prior to the Control Line, but only after the apex of the final turn or another turn as nominated by the RD, and provided the green flags have been displayed. Speaking immediately post-race, Van Gisbergen explained simply that “I saw the green flag so I went beside him and didn’t pass him before the line”. 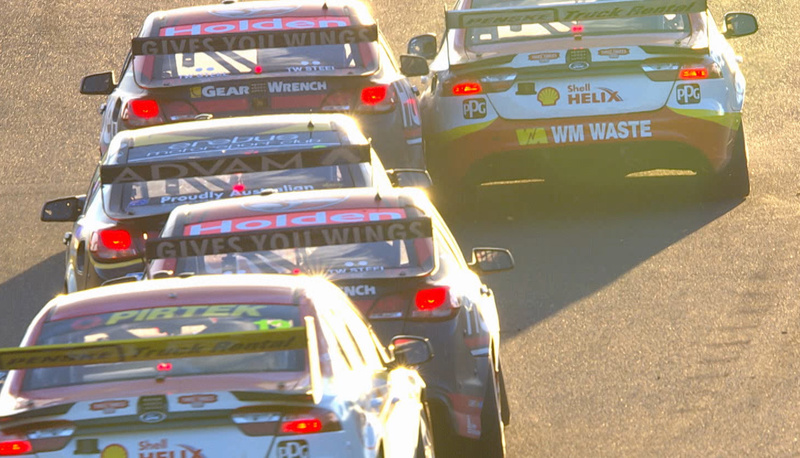 McLaughlin, however, questioned whether the restart was legal, saying that “I felt like Shane pulled out a bit early”. Triple Eight team manager Mark Dutton initially felt that the team did not have a case to answer, but noted that “it looked like it was a bit late when they released the Safety Car”. When quizzed on the matter during the race, Shell V-Power Racing managing director Ryan Story said that "It didn’t look that flash, did it?". "Heading into Turn 1 there, for Giz to be up alongside, it didn’t appear the Safety Car was where it needed to be for that to start taking place," he added. "But we’ll see what happens (with the review).". Having experienced the restart further back in the pack in seventh, eventual second place finisher Chaz Mostert described the issue as a common one at Sydney Motorsport Park. “We always struggle here with our Safety Car restarts because the straight is so long and the Safety Car always gets released probably a bit too late,” he said. 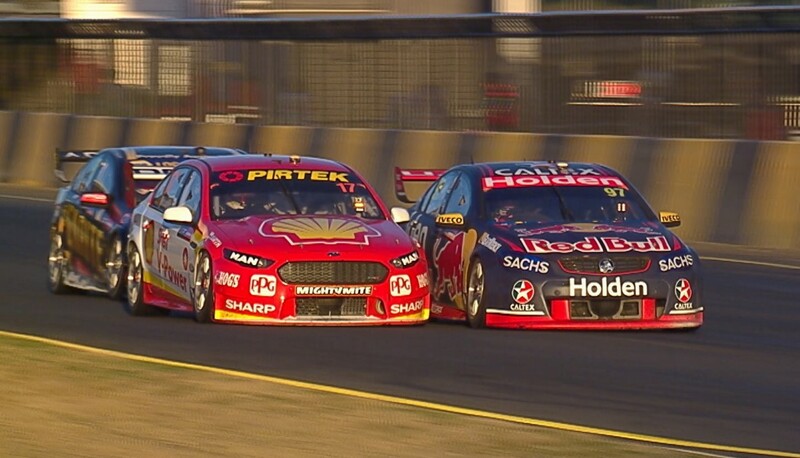 Van Gisbergen was penalised for being overzealous on a restart last year – losing a likely victory for overtaking Michael Caruso before the control line in Race 12 at Hidden Valley. The Red Rooster Sydney SuperSprint will conclude today with a 20 minute qualifying session from 1100 and a 200km race from 1400 local time.